And with that little paw rising Blaze laughed. She reconized the dodging of the question but for now she'd play naive about it. And if the zoura crossed over the line it would be her own funeral. "No there's no need. Spikes are hard to eat through I've tried before." She streched her mouth out at the memory. Behind her she could hear Koin moving, she hoped he hadn't heard that, poor guy was already terrified of Delia. Blaze didn't want him imagining her trying to eat him. "And in the end the meat inside isn't worth it." she snorted. "I much prefer flyers and fish" Memories of Akira fishing up magikarp and feeding them to Blaze aroused. Blaze glanced down at Delia. Like the little zoura she was a hunter and liked meat but unlike her she didn't relish in it. Either way it was something they had in common. "When would you like to start training?" She asked. Chivalry awoke with a start, chasing his nightmare away. In it, the boy he searched so diligently for was dying, ripped open, drenched in blood and scooping up his spilled entrails as if desperately trying to return them to his abdominal cavity. His crystalline eyes shone with fear, stark against his blood-flecked cheeks and ringed with heavy black circles. The Gallade's heart was racing, and he brought a trembling hand to his chest as if to still it. Now was not the time to lose his cool. Smiling slightly, he reached back with one hand and stood, using the rock wall as a guide. He surveyed the area below the mountainside warily, making sure no Infected were nearby; it appeared Rin the Glaceon had taken care of all the close-by ones. Feeling more at-ease, he looked down at the fox and the ferret: "Are you prepared to leave?" he asked courteously, "It is less dangerous to travel in the light; we shouldn't waste it." "When would you like to start training?" the fire beast asked with a grin. Delia matched the other's expression and wagged her tail a little. The gallade stood, bracing himself against the cave wall. "Are you prepared to leave?" he asked politely. "It is less dangerous to travel in the light; we shouldn't waste it." Delia's grin was on full force. How thrilling. "I'm sure that I'm ready to travel." She eyed the yellow spiney thing and tilted her head, intrigued. "It would be good for us to move soon... some of us might... expand more... if we were to stay sedate much longer." 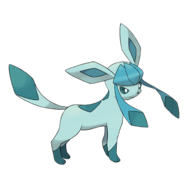 She trotted, tail high, near the gallade. "So, fearless leader, which way? Is there a point to this escapade or are we meandering aimlessly? I'm up for both, but I'd like to know all the same..."
Koin stood up on all fours, satisfied with his neat fur. Let's hope it doesn't mess up as easily as last time... The Jolteon padded in a circle, enjoying the feeling of a groomed pelt. Master had always said that you can't beat an enemy if your fur was an enemy too. Koin chuckled at the nonsense young Master spouted in an attempt to act older. "Are you prepared to leave?" Chivalry's voice came from the other side of the cave. The Jolteon glanced out the mouth, and noticed how the sun had started to peek out of the horizon. Much time had passed- Koin stretched out his back once more before springing upward in excitement. A new adventure? A perilous journey? The road to death? Koin would not know until he took his first steps to a million more. "I'm ready." Not even the words of the Zorua could bring down his high spirits. Blaze turned to look at Chivalry as he rose from his rest. And as he looked around at Rin's handiwork, he seemed impressed and turned back toward Blaze and Delia. "Are you prepared to leave?" he asked courteously, "It is less dangerous to travel in the light; we shouldn't waste it." Blaze made a clicking noise out of habit, but she realized that none of these pokemon would realize that she meant yes. The clicking was a way she had communicated with Akira, and eventually she'd been able to speak with the rest of her team had picked up on it. "So, fearless leader, which way? Is there a point to this escapade or are we meandering aimlessly? I'm up for both, but I'd like to know all the same..." The zoura said to the gallade. "I'm going to New Bark Town." Blaze said, there was no question in it she was going there and that was that. "On the way though maybe we could stop by the gyms and centers?" Blaze offered. "The gym leaders always had food for their pokemon, and I doubt in the epidemic they would have had enough time to grab it and leave. Same for the centers." suggesting that they had really left and not had been killed. " I don't think you can grow berries every place we go so it's worth a shot. We can always check for the undead before we enter." "So, fearless leader, which way? Is there a point to this escapade or are we meandering aimlessly? I'm up for both, but I'd like to know all the same..." Chivalry heard Delia ask as she trotted up beside him. He struggled to decipher if her jovial words were genuine or a ruse to lure the others into complacency. But her question had its merits -- he himself had no idea where to begin. All he knew was that remaining sedentary was dangerous. Blze mentioned gruffly about going to New Bark Town, and the Gallade was irked that she had the gall to drag the others into her business without their consent. However, he kept his mouth shut -- maybe going to New Bark Town would be a good idea; though keeping close to towns would be dangerous, the Centers would indeed have spare food locked up somewhere. And what she said about his Berries was true -- there would be no way for him to grow them along their journey; he would have to plant them as they went, and return to pick the Berries some other time. "I suppose New Bark is our destination. Truthfully, I did not have a plan in mind; I am merely searching for this boy who Evolved me...and I have not investigated New Bark yet. Though I don't know how safe it will be to enter towns...I have seen some terrible things in urban areas." He remembered Ecruteak and the frenzied spread of Infection; he couldn't shake the feeling of the bloodshot eyes on him. Swallowing thickly, he looked back at his team before stepping out onto a nearby rock face. He began to descend the rocky face of Mount Mortar, all the while thinking of the poor souls of Ecruteak. Delia watched as the gallade considered the beast's destination. She could tell that the fire pokemon's abrupt "suggestion" angered him, but she didn't see a reason to protest. Honestly, it was safer traveling with the gargantuan thing than to not. New Bark Town... Delia wasn't sure exactly what the town was like or what it looked like... but at this point, she figured all the towns looked alike anyway. She looked down at the descent and made her way along, keeping her ears open and her nose alert. They were on the move. And she was very willing to wait. Koin hopped up in his eagerness. "New Bark Town wouldn't be too bad," he spoke, thinking of the time he first arrived in Johto. The windswept grass and fresh air would surely ward off some of the infected? The Jolteon glanced at his team- they would make it. Their strengths covered the other weaknesses of one another. The Lightning Pokemon glanced at the Gallade, waiting for his instruction. He was the group-elected leader, and there was no doubt of it. His control over his emotions would lead him to make the right decision, and his traits left a good impression of a strong and silent knight. Koin grinned. A chivalric knight, that is. Blaze glanced over at the Gallade. He had misunderstood her; when she had said that she was going to New Bark town, she didn't mean that they had to come along as well. 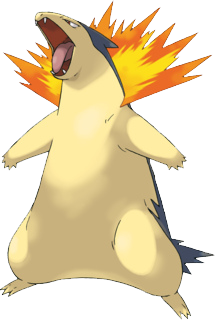 But everyone seemed to agree on going there, so the Typhlosion didn't say anything about it. As Chivarly began to walk, Blaze followed, but for some odd reason she stuck beside the little meat fanatic Zorua. Despite the fact that she didn't trust her and found her hunger odd and evil at times, Blaze liked Delia's little quirks and her smarts were entertaining. Blaze glanced at the unappointed lead, Chivarly: he was out on a search for a human he barely knew, and he was kind and had good manners, definitely earning his name. Blaze respected him a bit for that, enough to follow him for now. Truly becoming a leader and someone she'd put her full trust in would take awhile. As they walked, her thoughts drifted to her goal: her master and her team. She wanted to help them and be there for her friends. The thought of friends led her to think of her best friend; she still had to give Zeus an answer. Blaze clicked lightly, almost sounding regretful about something. After a moment, though, she was back to scanning her ground, making sure they where on the right trail by keeping her eyes out for familiar markings. Chivalry's footfalls on the rocky path were light, his step slow but springy; he had to keep his body fluid and ready to fight. The Zorua followed a few steps behind him, and as he cast a short glance over his shoulder to check the rest of the band, he noticed her ears pert and her eyes attentive to her surroundings. He smiled -- she appeared to be happy and alert, willing to watch out for the group. The Jolteon, too, looked bright-eyed and bushy-tailed, padding along at the back of the group. Even the tall Typhlosion, who Chivalry still thought a bit ill of, seemed relatively at-ease and intent on moving forward. Best of all, nobody was trying to eat anybody else. Maybe things were changing for the better...? As the group climbed a tall, gently-sloping hill, Chivalry swallowed hard; he knew that from the top of the hill, they could see Ecruteak, the town from his nightmares. His feet seemed to drag as he climbed, forcing himself to confront the town where he had seen so much blood, death, and primitive behavior. Finally, they crested the hill, and the rest of the route dropped away from them, curling away to the burnt remains of Ecruteak. Chivalry winced. They would have to pass through the town to get to New Bark. They traveled for a time until reaching a gentle but high hill that overlooked much of the surrounding landscape. The gallade stopped at the crest, and she sensed a change in his demeanor. Was it... fear she smelled? A little confused, she turned to the sight and saw a town splayed beneath them. It was more of a deserted ruin now, and even from their perch, she could see Infected crawling about. Her ear twitched. She enjoyed the thought of slaughtering Infected, but the gallade's uneasiness was contagious. Oh, if only her bosom-friend was with her... Surely, he would have enough confidence and power to stave away the Infected. She looked up to the gallade and quirked a brow. "Something wrong? You seem to be a little hesitant, fearless leader." Blaze stopped and looked down at Ecruteak an choked on any word she had to say. She remembered the proud historic town she had visited when Akira wanted a battle against Morty the first time she'd been a quilava and then after that she'd just battle with the ghost here for the heck of it. This wasn't it, this was nothing more then a skeleton. "Come on." she managed to say before she began to walk forward, her walking soon became a slow jog and then a run. When Blaze entered the town she looked around at the abandoned dance house, remembering the beautiful geishas that had danced here. Her eyes then turned toward the gym. She wondered if... she stopped though and looked back at the rest of the group. Remember they are technically you team now so wait. Chivalry reached up to put a hand to his chest, as if trying to still his racing heart with his touch. Swallowing thickly, he turned to the Zorua who had questioned his stopping. "Something wrong? You seem to be a little hesitant, fearless leader." He turned to look back at the smoldering town, ruins veiled in pitch-black smoke. "It was in this place that I first encountered the Infection." he said simply, the words sending shivers up his spine. He recalled the bloodshot eyes on him as he entered the town, the ill humans and Pokémon consuming Berry after Berry in vain attempts to heal themselves. Senseless, pointless. Ruin. It was the Typhlosion who bounded down the hill first; the Gallade remained hesitant, shuffling down the hill and entering the town with care. All around, contained fires smoldered, blackening the sky with thick, pulpy smoke. The ruined buildings were coated with ash, which fell from the thick clouds overhead in the place of rain. 'What a miserable place.' Chivalry thought, a depressed and slightly-fearful glower entering his face. It was strange to see the gallade so blatantly show his fear, especially to her. She quirked a brow as he shuffled down through to the town's borders, catching up to the meat tower. It seemed he trusted her enough to show weakness around her, but she wasn't quite sure why... She followed, and then changed into an infected typhlosion again, simply because Blaze was nearest to her. Koin controlled his gasp as the Zorua transformed once more. It's just a little black fox... He reasoned with himself over and over as he padded in line with the rest of the group. Leaving Mt. Mortar had been easy enough, but finally traveling into a city had been no easy task on his nerves. Spiking out his yellow fur, the Lightning Pokemon stuck to the end of the group. "I'll keep the rear of our group covered." He called to the rest of his new team. Nothing would get them from behind, and no infected Syther will come in stabbing his teammates to death... Koin sighed, watching Delia wander off. He had decided to ask the sneaky Pokemon to personally help him with his infected Pokemon phobia- although learning to trust her would be difficult, he figured this is one step to that goal. Her ability to look and nearly smell like one of the undead was his only way to getting over his fright without being put into any danger... hopefully. Rin ha returned to Mt. Mortar a few moments ago, to see her mates gone. "Huh.... They must've left without me." bitter disappointment sounded in her voice as she tried to track down the scents of her fellow friends. The smell was still unfamiliar to her, and she tried her best. Even though, she lost the clues when she was in Rt. 42, all helpless and lost. "Well, they had better be close to here... Or else I'll eat my tail." the Glaceon sniffed the air again, making another attempt. Her tail was drooping from the heat as she padded along the grass, looking for berries that might sooth her thirst. She spotted an Aspear Berry nearby, and, even though she did not quite appreciate sour berries, she wolfed it down. As Rin travelled with alarm and curiosity, she found that this place was quiet, perhaps the infected had already been cleared away by her friends, and the only one left are the Murkrow, which are pretty easy to strike down for her. She veiled herself in a Blizzard to save further trouble as she continued. Then, the Glaceon spotted what could be called a rather tall building, a tower, the two towers. Both of them seemed to be quite high. "Okay... Civilization. I hope the infected aren't feeding on the dead there." she poked her head around. "Helloooooooo..." Rin looked in the Centres and the Marts, thinking that they'd be stocking up on the Potions that are thrown on the floor in panic, but obviously not. "Helloooooo?" Blaze rolled her eyes at Delia's transformation into an infected typhlosion again. But the volcano pokemon had stopped caring and instead kept her eye on the jolteon Koin. After his last freak out over Delia's transformation she was a bit worried, he seemed to be staying away from her, well he had plenty of reason to try to avoid the little fox so Blaze took this as a normal sign. "Don't get yourself killed Delia." Blaze whispered to her before she went towards the dance house. The typhlosion spotted the center and the mart "Blade we should head there for..." A moving blue figure caught her eye "Rin!" Blaze said as loudly as she could while still whispering. Moving quietly which was surprising for such a large pokemon. Wary and stepping lightly, Chivalry moved through the city, keeping close to rubble to avoid being out in the open. His eyes watched the skies and the ruined buildings, and his blades were half-extended in anticipation. His heart thudded in his chest. Blaze caught sight of the PokéMart and began moving towards it when she noticed the Glaceon, who had just caught up with the group. Their voices were like gunshots in the crackling silence of the city, and Chivalry's heart began to beat faster. The Infected would come. Trying to control his fear, he crouched low and sped across an open street, heading for the mostly-untouched Mart. If, if there was anything left inside, it would be a lifesaving miracle. Delia poked her head into the broken door of the dance theare, sniffing the stagnant air beforehand. It didn't smell or sound like anything was in there... She pushed her Illusion bulk through, her new found mass causing her a little bit of trouble. She stumbled through the door, tripping a little and landing on the dusty floor, earning a grunt. She shook her head and searched the immediate area, not moving too much just in case another Infected was around. Though she wouldn't mind killing and feasting on an Infected, they tasted like ash in her mouth and always had to immediately spit or vomit it back up. She frowned at the memory. Never again. She trotted until she heard a small gasp, which attracted her rapt attention. Eagerly, she fumbled and sniffed out the other which erupted out of the rubble. A small Deerling, weak and starved, tried its best to charge through the door. Its little legs, however, were too scrawny and feeble to carry it and it tumbled onto the ground. Delia pounced, her Illusion portraying a hideous maw agape, hungry for the little Deerling. Her bite was quick and regretfully lethal, killing the prey almost instantly. Delia's bloodlust and hunger engulfed her as she gorged herself on the carcass, picking it clean within minutes. Once she was done, she left, finally satisfied and belly full. Outside, she noticed the blue thing conversing with the muscle tower and grinned. Well, the blue thing could simply be a last resort... even though she was delectable-looking. She lumbered forward and transformed back into her normal form. "Good to see you again..." she said loftily as she looked around. "I think this immediate area is ok. I didn't find anything but a meal in the theatre." She grinned as she shook herself, a bit of spare blood dropletts flying off of her. Rin sniffed the air, and then saw Blaze hailing her down. She was about to proceed to the tall Typhlosion when the Zorua greeted her as well. She looked towards the small creature and found blood on the fur near her mouth... Rin cringed. She didn't eat live things very often, but only necessary. Berries were more the diet for her. She shook an ear before heading to the PokéMart. The Centre will be useless without their PokéBalls. "So..." she said a little disgustedly at the corpses littering the floor, then at Chivalry the Gallade. "Are we going to get some things we need?" she climbed nimbly onto a shelf and nudged down a couple of Potions as quietly as she good, as not to startle the infected. Then a few sprays that heal poison, paralysis and those annoying things. "Are we just going to raid every shop like this?" she grinned. Blaze's glare turned toward the zorua " DId you even check to see if it was infected?" the typhlosion's voice cut through the silence that surronded the city. Maybe the most messed up thing about this situation was that Blaze wasn't questioning Delia for eating another pokemon. Blaze then followed Rin into the poke`mart she had the same feeling of disgust well up inside of her as she stared across at the corpse. Trying to ignore the bad taste in the back of her mouth the typhlosion went to the back of the store as the other's went over the potions and such. Opening the closet door she looked around her fire giving off a soft light. She sniffed the air Blaze's breath causing some mist. Certian that there where no undead she went farther in and found what she was looking for. As the others got busy collecting things from the mostly-intact store, Chivalry stood over the corpse of a particularly wealthy-looking man. His body, though emaciated, was bloated from decay, his suit full of holes chewed by starving Venomoth. His white hair, too, had been eaten by the roving insects. His eyes were open, painfully so; the Gallade thought they would pop out of his pale, puffy face. His jaw was set in a crooked, gaping, silent scream. Setting his jaw against the nausea welling up in his gut, Chivalry knelt and reached out a hand, resting his fingertips over the man's taut eyelids; he tugged the skin down over the human's corneas, closing his eyes to make his death more dignified. Once the eyes were no longer on him, he reached into the lapel of the man's suit, withdrawing a solid gold pocket-watch and casting it aside. He dug further through the pocket, rifling past old pills and crumpled bills until he found what he was searching for -- the cool, unscathed steel of a flask. (Humans use this to carry something called 'alcohol' -- a terrible substance when injested, but wonderful when burned.) He withdrew it and stood, eager to get away from the horribly-bloated body; he turned the flask in his fingers, watching the dim afternoon light from the open door reflect off the metal. "We'll need this." he said with certainty, turning and offering it to Blaze, who had come out of a back room with a bag clutched between her teeth. With that, he turned his back on the starved corpses and stepped into the afternoon sun's bittersweet rays. They were not as warm as they should have been...perhaps the cold was finally on its way. Delia had to laugh after Blaze had questioned whether her prey had been infected or not. She found it odd that she was scolded on the quality of her prey, not the prey itself. Maybe she would be able to "befriend" the muscle beast after all? She found the gallade rummaging through the decaying corpses of humans and Delia flicked her ears back at the stench. For some reason, humans always stank worse than any other pokemon... even gloom. She made her way through, her delicate form and feet carefully dodging the dead as she joined in the rummaging. She hopped behind the counter, and though she could tell the store's berry stock had run clean out, there were potions and other healing items. She grinned and started tossing them out toward the fire beast, trying to aim for the bag the other had produced. "Just wondering," she asked loftily as she examined some damaged potions, "who will be carrying the bag? If one of us were to get separated, or even if the holder were to get Infected, how will we dispense the potions?" She tossed a final full heal into the bag with a skillful toss of the head. Silently watching the others pack up on provisions, Koin padded off to stand beside Chivalry. The tall Pokemon stood stoically, watching the sun set into the horizon. A question had been nagging him since they departed from Mount Mortar, and the only one who seem just to ask was the Gallade next to him. "Uh, Chivalry... do you really think we can survive?" Koin started, fluffing up his yellow fur. "We are in a group, yes, but the numbers of the infected are growing still. I'm... just unsure if our attempt at trying to live is worth it or not." The Lightning Pokemon took a deep breath. "Do you believe we should keep going, even if it means taking a risk of death?" Koin's heart beat frantically, even when the scene seemed clear of danger. If their leader didn't had the verdict of surviving, what chance did they have?